Dren's B-Spot: KLB Virtual Journey Eternal Rider Winner! 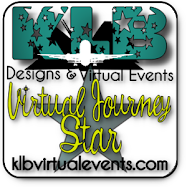 KLB Virtual Journey Eternal Rider Winner! Congratulations! You will receive an email asking for your mailing details! You will have 48 hours to respond, or another winner will be chosen. Special thanks to everyone for entering the contest! And a huge thank you to KLB Virtual Events for putting this tour together! Until next time folks!